Keep everyone safe with the methods of modern technology and buy what you need at Aldi stores on 16 February. You have deals on security cameras, video doorbells, different kinds of locks, and similar sort of products to keep your house secure. Security equipment and upgrades are not only important in terms of safety, but they can also increase the value of your property. If you sell your house or shop one day, these will be their additional features. Aldi also offers hardware tools like drill driver, air compressor, ladder, electronic levels, and more products. Make the changes yourself at your home. But first, you need the proper equipment, powerful hardware, and fair prices. Workzone tools usually provide sufficient and powerful tools for those who need such tools in their DIY projects. 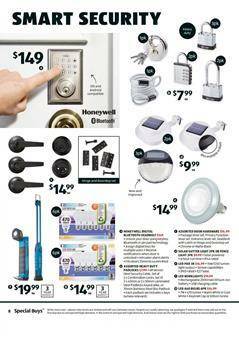 Aldi Catalogue deals are the special buys week 7, 2019. You can find a good backyard furniture and renew your garden with great deals by Aldi Catalogue. Browse the catalogue for more products, follow our Facebook page for the future Aldi Catalogues.